I now feel qualified to put something up on this post. We played for two whole days in my physical science class, and the kids still want more. Another day in my three physics classes, and I’m battle ready. I began by showing the balloon on the bald teacher’s head and sticking it to the wall. Trust me, nothing gets them going more than a mostly bald teacher trying to rub a balloon on his hair. Amazingly, there were quite a few students that had never seen a balloon charged up and stuck to a wall. We then went to the standard acrylic/fur type of static charge, explaining how the charges separate. I caused paper and bits of styrofoam to jump from the charge. The van de graaff generator is exactly like those static creating devices, but it just keeps making more and more static. Here are a few ideas I have either done or picked up on the internet. One important note; I got all of the kids up and involved. Some of them were scared, but after the girls charged up their hair without pain, the chickens were shamed into bravery. 1. I take a bunch of holes from a paper punch and put them on top of the dome. Then I turn the machine on and the holes fly up into the air. The dome and paper, all having the same charge, repel each other. The paper holes spray up in a fountain of white dots. 2. I tape strips of paper to the dome. The paper stands up and stays standing until the dome is discharged. This is a good precursor to the hair thing. They don’t expect the paper to stay up in the air when the machine is off. 3. I use the grounding electrode to make the sparks jump really far. Let the generator run until you hear the ozone crackling. Then you get a great big spark. I use this to build some tension and fear of the generator because I’m asking for volunteers to do the hair thing. 4. Making hair stand up. The student needs to stand on a plastic milk crate or something to insulate them from the floor. One student wanted to try this standing on the ground. I think he had sweaty feet, he said (and we heard) the discharge going through his feet into the floor. I wish I could tell you how to know what kind of hair works best. Really long hair is too heavy, really short hair is too stiff. Hair color doesn’t seem to matter, although dark is easier to see than blond. For some reason, the hair of the black girls worked best. I’d love to post the pictures, but posting pictures of student’s is a no-no, at least without written permission. 5. Fluorescent light bulb lights up. It does not need to come into contact with the dome, the spark jumping to the glass with light up the bulb. We found that placing the bulb about 1 inch from the dome gave the best results. Stand on a piece of wood or you will feel the shocks in your toes. 6. We made a chain starting with one person charged up. He touched the next person, but held on. Now they both charged up and continued to another person. If the person getting shocked was sitting in one of our desk/chair units, he or she got a constant stream of shocks to the legs and back side. 7. Water bottle on top produces lightening like show. I’m going to tell you to be careful with this one. It works pretty well at first, but the massive sparking in the bottle actually burned through the bottom of the plastic bottle. Once they started leaking, they wouldn’t charge up. I had to use a different bottle for each class. More importantly, the bottle kept the charge. Just holding the bottle and moving it around gave a constant stream of rather painful shocks. At one point I was holding the grounding rod and the bottle. I touched where the bottle was leaking through the bottom and I got an extremely nasty jolt across one arm to the other. Be careful with this one. 8. A balloon placed near the dome is first attracted, then when it touches the dome, the charge is conducted and it is repelled. The charge leaks off and this repeats over and over again. I used this to lead into Coulomb’s Law and the force due to the electric charge. Again, you will want to stand on something to insulate you or you will have toe sparks. Mini pie tins stacked on top fly away one at a time – the pie tins I tried were too big. Soap bubbles are repelled as they get near the dome. Let’s start off with the theory. Water has more of a positive charge on one side and a negative charge on the other. This is because of the way the molecules bond. The picture on the right shows the Mickey Mouse structure of water molecules. Oxygen has six electrons on the outer shell and wants to have eight. So it uses the electrons from the Hydrogen atoms to complete its shell. I’m not a chemist, I don’t know why the molecules make a Mickey Mouse and don’t spread out onto opposite sides, but they don’t. The result is a net positive charge near the ears and a negative charge on the other side. There is a really cool and simple demonstration to show the polar nature of water. Turn on the faucet so that you have a laminar stream of water coming out. 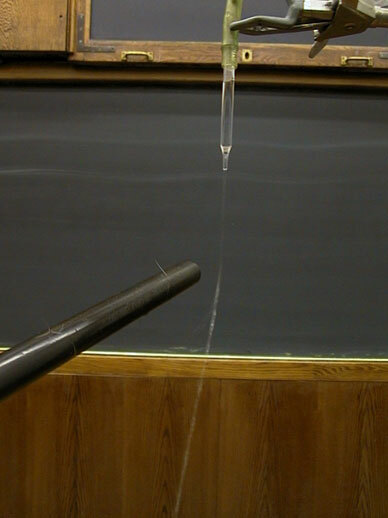 Alternatively, you could set up a simple apparatus that controls the flow of water from a flask. You want the stream to be a small as possible but still laminar (flowing in a parallel stream with no turbulence). Now charge up a plastic rod or a comb or anything that will hold a static charge (even a balloon rubbed on your hair will work. Put the charged object near the water and the stream will deflect. This freaks the kids out. I love freaking the kids out.